Our Elders Program aims to provide students with an ongoing opportunity to build relationships with Elders on campus and gain a wider sense of community and provide learning opportunities through inter-generational connections. It also allows Selkirk College staff and faculty to get to know some Elders in the community, develop a deeper understanding of the diversity of Indigenous perspectives and seek council from trusted cultural advisors as needed. Despite the ongoing legacy of colonization and forced assimilation polices including residential schools and the Sixties Scoop, resulting in intergenerational trauma and for some individuals disconnection from traditional ways, Indigenous communities have always had those who have resisted and kept their beliefs, languages and practices alive. Elders and Knowledge Keepers carry their stories, teachings, laws and songs within them to pass on to the next generations. We are honoured to support their visits to our campuses where they share their knowledge and experiences with our students and wider College community. 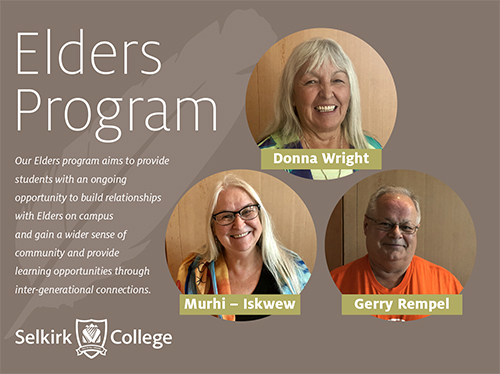 The foundation of how we interact with Elders and Knowledge Keepers at Selkirk College is based on relationship, interconnectedness, context and reciprocity. Self-reflection on these values is encouraged for individuals seeking support from Elders. These values are touchpoints to ensure that we are on a good path of relationship, interconnectedness, context and reciprocity. To learn more about Our Elders Program read our handbook here. 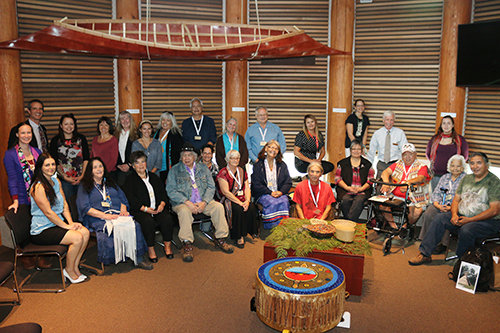 On September 24, 2015 Selkirk College hosted an Elders Gathering to provide an opportunity for Elders to connect with students and with each other. The students played a major role in hosting the gathering and were able to honour the Elders for their contributions and commitments to supporting them during their studies. This tradition continues today and has grown into our Elders Program.